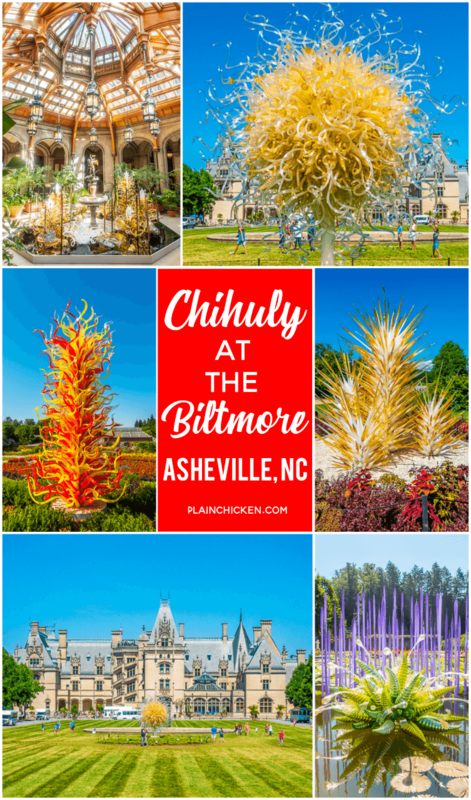 Chihuly at The Biltmore - Asheville, NC - the first art exhibition in Biltmore’s historic gardens, and the first garden exhibition of Dale Chihuly’s works in North Carolina. 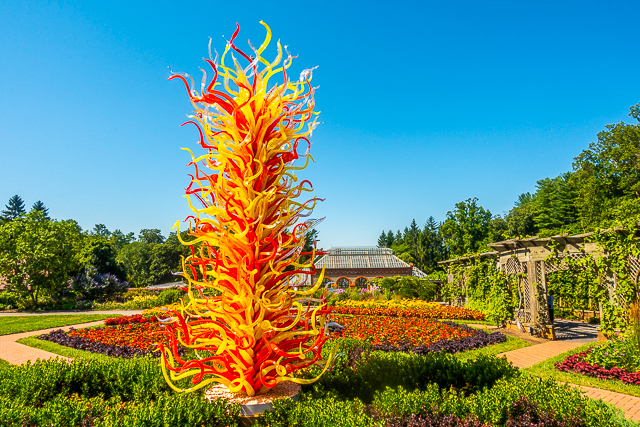 16 stunning blown glass sculptures installed in some of the most beautiful gardens in the country. 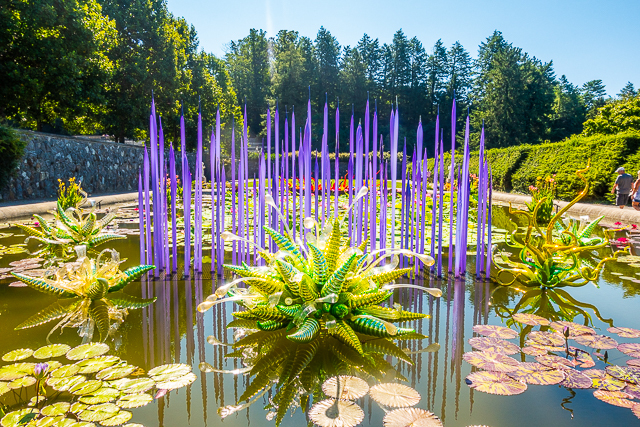 A must if you are a Chihuly fan! 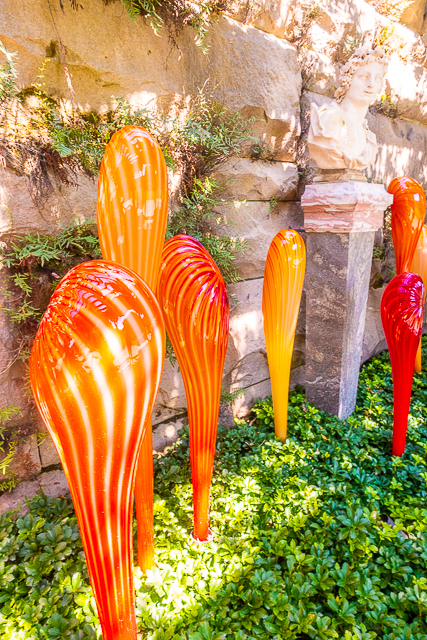 I am a HUGE fan of Dale Chihuly's blow glass art. 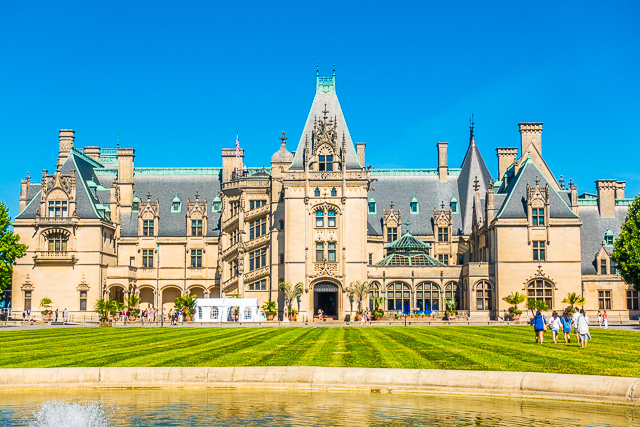 When I heard that his work was going to be on display at The Biltmore Estate in Asheville, NC this summer and fall, I started planning a trip! 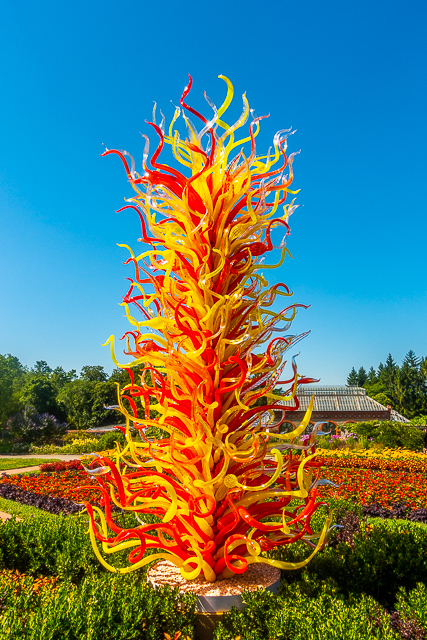 We saw a similar Chihuly exhibit in Atlanta at the Botanical Gardens. I loved it! I was thrilled to be able to see his work again in another setting. I was worried that it was going to the the same at Atlanta just in a different place, but it wasn't. 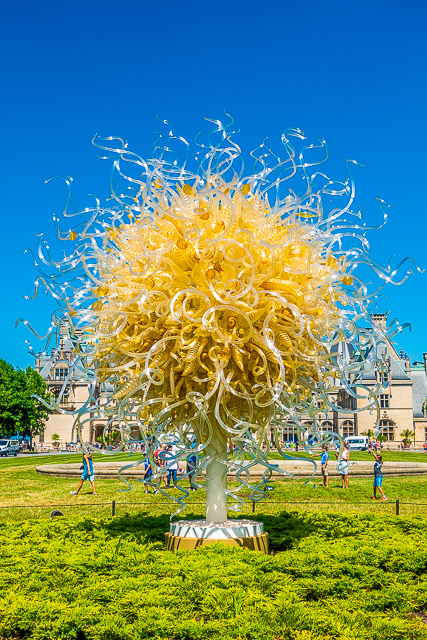 They made several new sculptures just for this exhibit at The Biltmore Estate. I did recognize some pieces from Atlanta, but they were arranged in completely different ways. 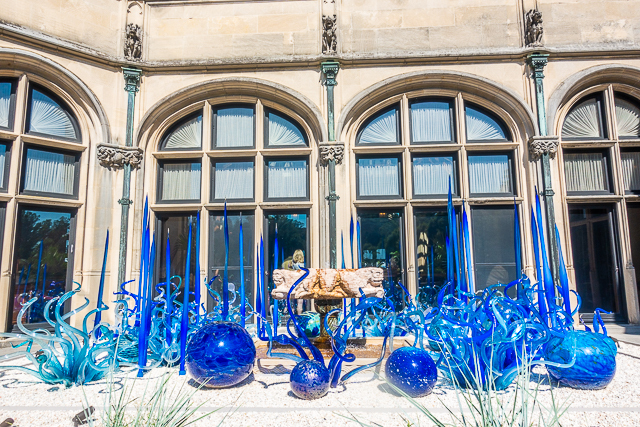 Chihuly at The Biltmore was incredible! SO beautiful! We had a great time walking the grounds and finding all the sculptures. 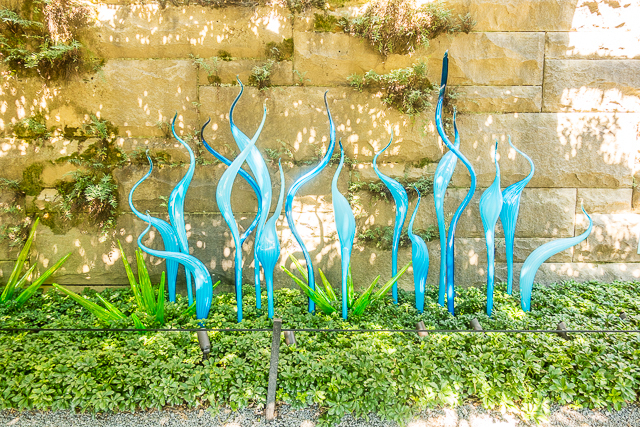 Today I am taking you along our journey and showing you all the sculptures in the exhibit. The exhibit is running through October 7, 2018. I hope you have a chance to check it out. 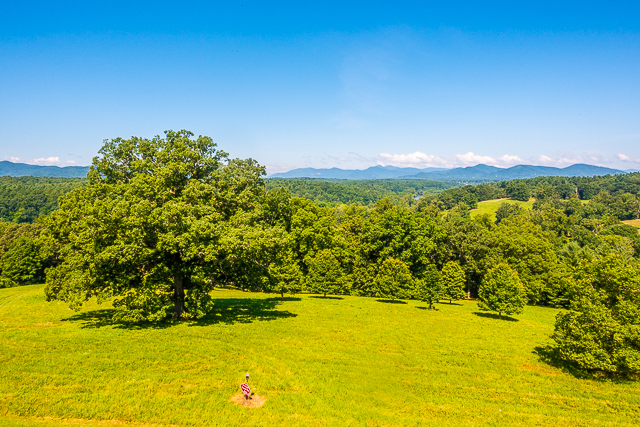 If not, I hope you enjoy my virtual tour! Don't forget to follow us on Pinterest for more travel ideas! You are greeted with Sole d'Oro. It was made in 2017. This was my favorite. Right outside the house, to the right of the door, is Sky Blue and Cobalt Fiori. It was also made in 2017. Right inside the front door is the only sculpture inside the house itself. 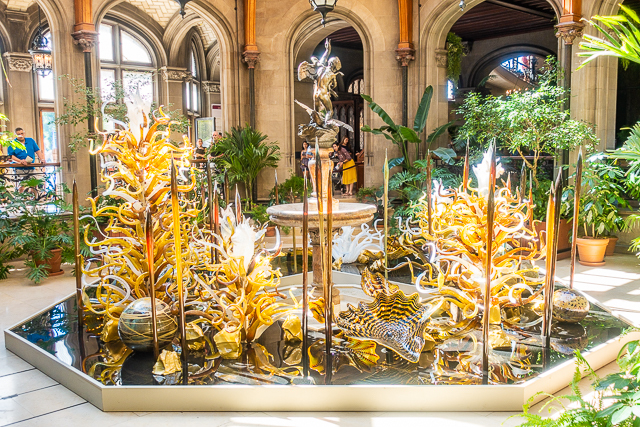 It was made in 2018 just for the exhibit at the Biltmore. It was beautiful! I loved the gold and black glass with touches of white. 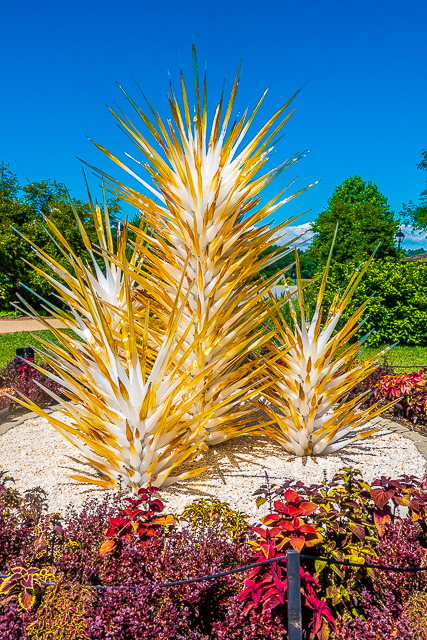 The gold and white formations simulate sea life and reflect Chihuly’s love of Venice. It looked AMAZING in the house! This was my second favorite. Next, we explored the gardens. Float Boat was up first. It was made in 2017. 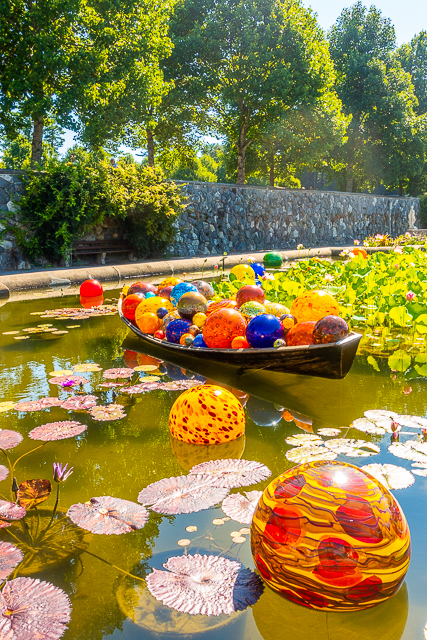 I LOVED all the colorful glass balls! Niijima Floats were surrounding the Float Boat. They were made in 2018. In the middle of the Italian Garden stood Palazzo Ducale Tower. This was made in 1996. 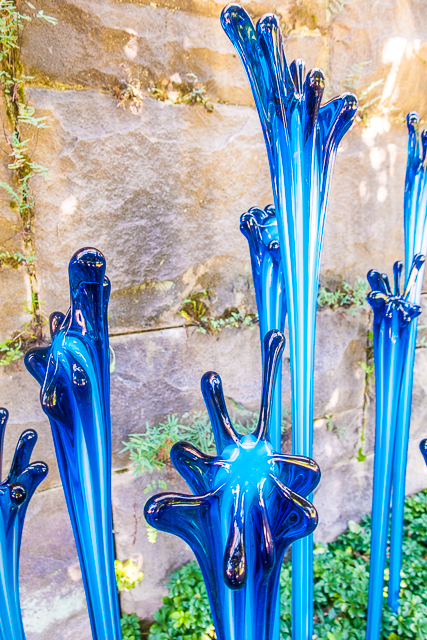 I love these blown glass towers. SO impressive! 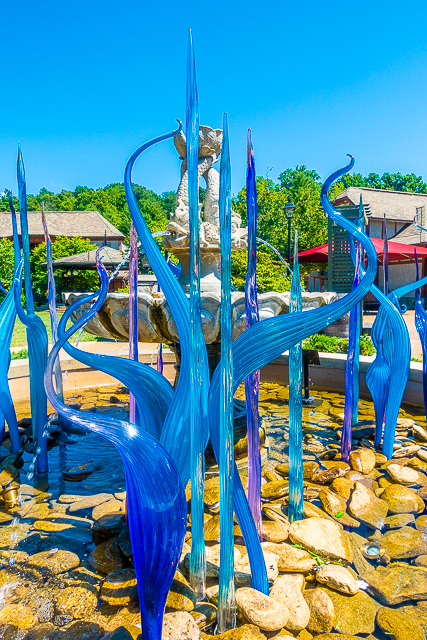 The back pond had two sculptures. Neodymium Reeds with Fiori Verdi. 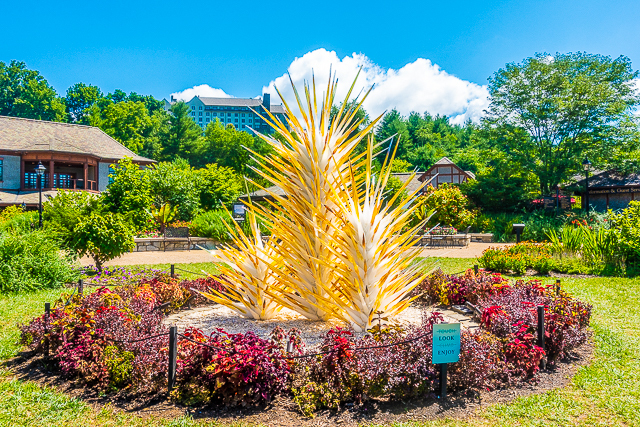 This sculpture was created in 2014. I loved the green and purple combination. It looked great with all the lily pads surrounding it. 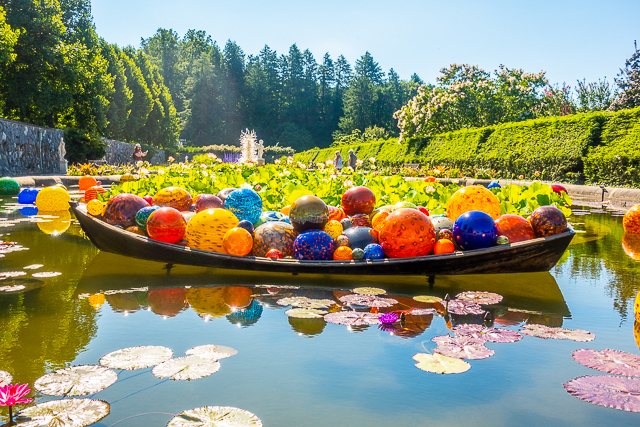 The last sculpture in the Italian Garden was Fiori Boat. It was created in 2017. I really liked all the long pieces sticking out of the boat. 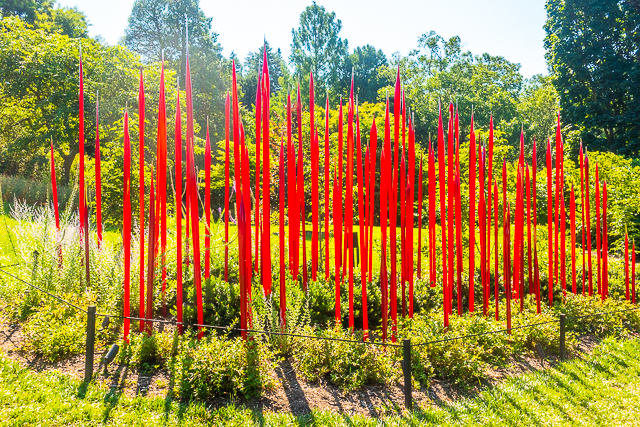 In the Shrub Garden stood Red Reeds. We saw these in Atlanta. They were created in 2017. Some stand over 10 feet tall. 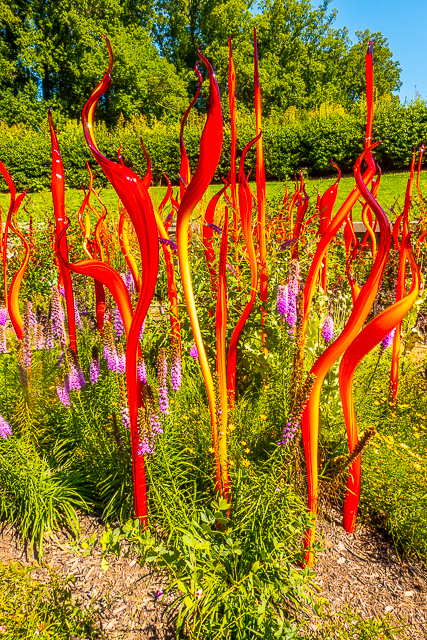 Inside the Walled Garden were two of my favorite sculptures. On the right stood Paintbrush Tower. It was created in 2014. I love the top pieces that are yellow with red tips. Very impressive! 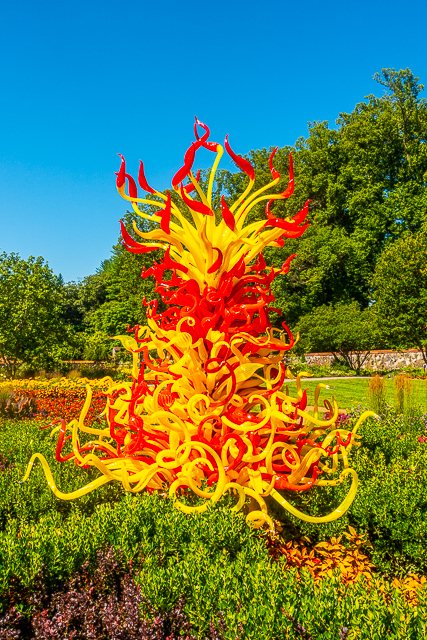 The second sculpture in the Walled Garden was Electric Yellow and Deep Coral Tower. It was beautiful. 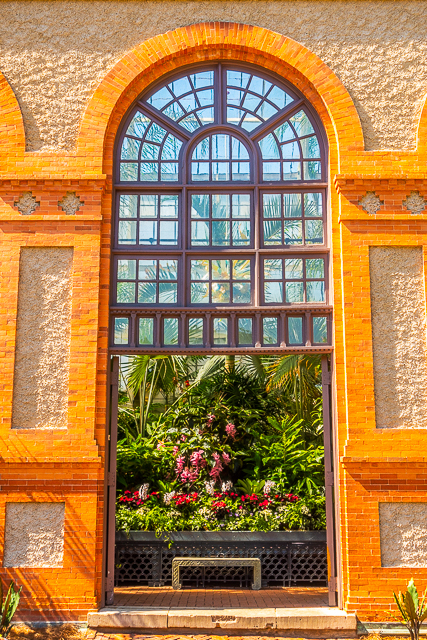 Perfectly placed with a great view of the Conservatory. 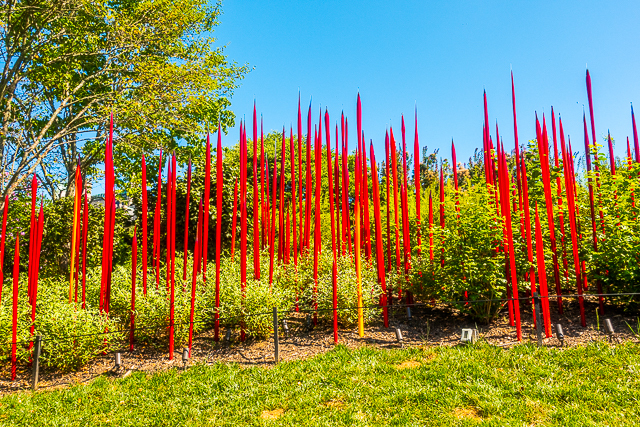 Right outside of the Conservatory entrance stood Cattails and Copper Birch Reeds. They were on both sides as you walked inside the Conservatory. They were created in 2015. 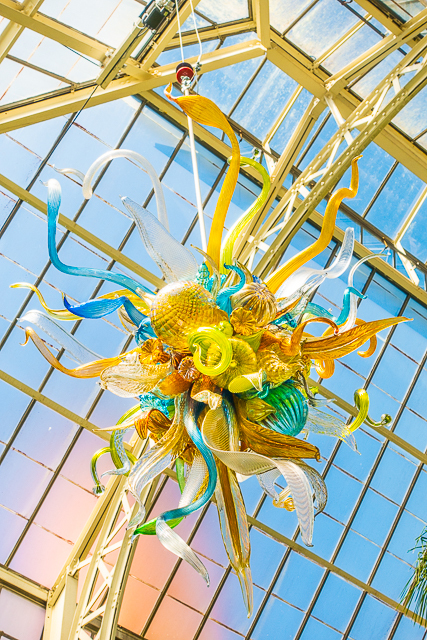 Inside the Conservatory were three large chandeliers. 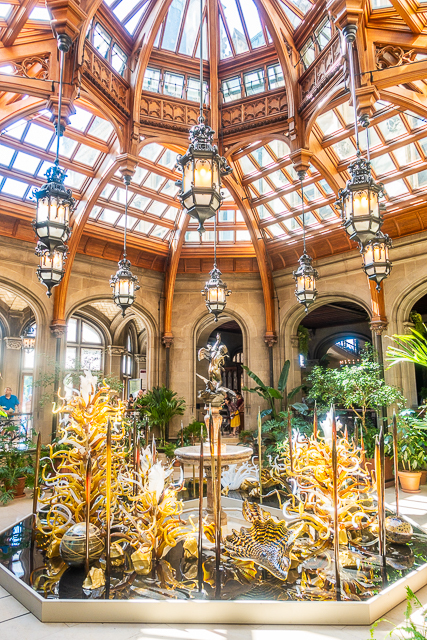 Burnished Amber, Citron and Teal Chandeliers. We loved the colors and all the different shapes in the chandeliers. 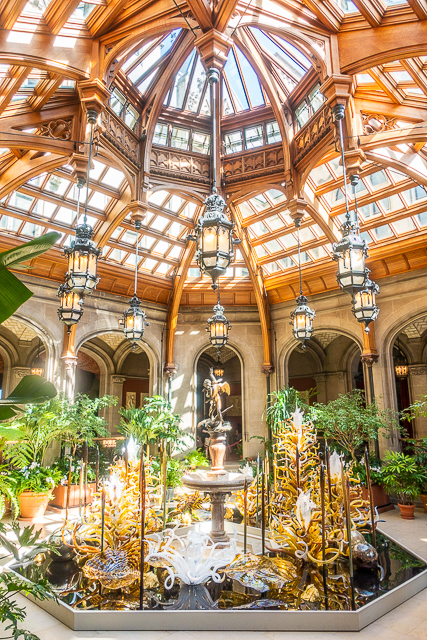 The last part of the exhibit at the Biltmore House was at the Pergola. 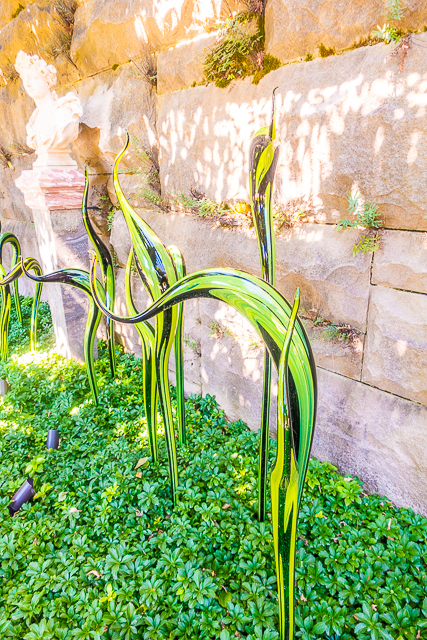 The sculptures were named Pergola Garden Fiori. Some of these pieces were also in Atlanta, just set up differently. 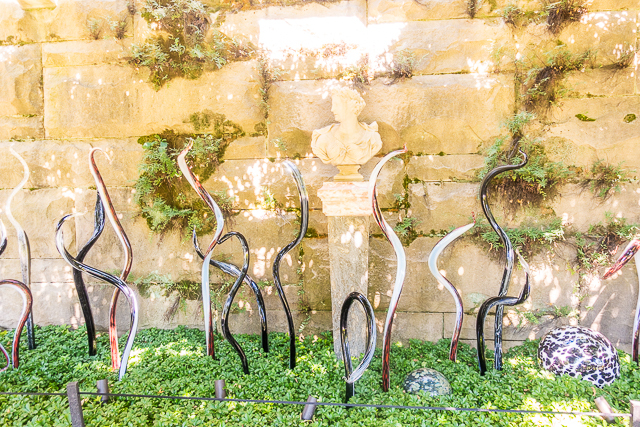 The sculptures were set up all along the wall of the Pergola. These were Chicken Legs' favorite of the exhibit. I thought they looked like snakes. These look like water drops. 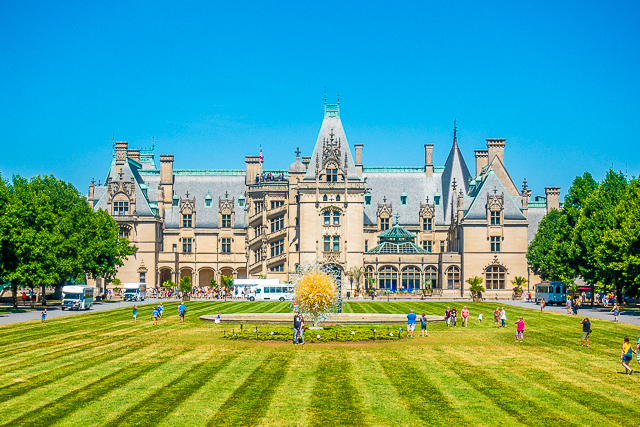 That was everything at the Biltmore House. 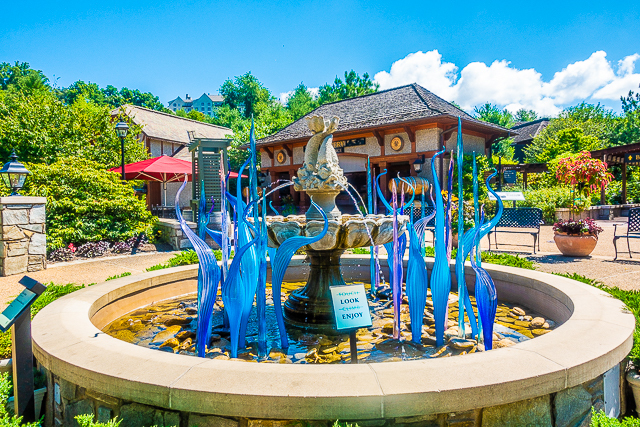 There were two more sculptures in Antler Hill Village. It was about a 4 mile drive. Alabaster and Amber Spire Towers - created in 2017. These Alabaster and Amber Spire Towers were right next to the Biltmore Creamery. We HAD to get ice cream after walking all over the grounds. 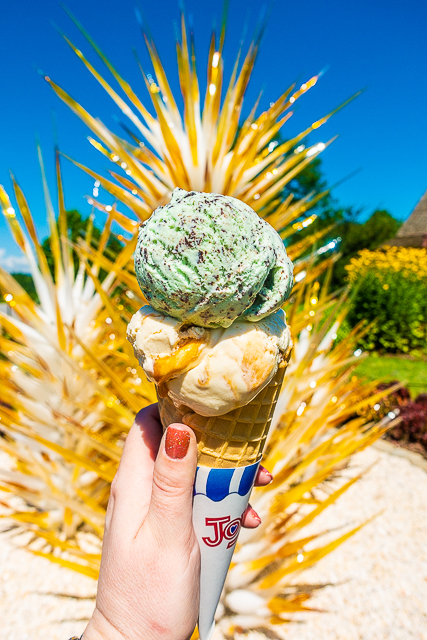 We got a double scoop of Mint Chocolate Chip and Salted Caramel. Hands-down THE BEST ice cream we've eaten! 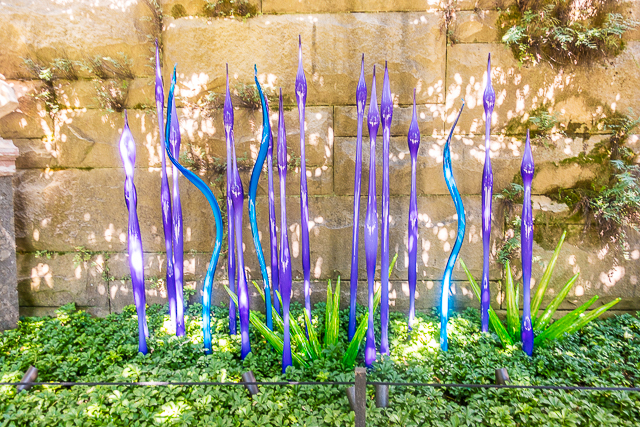 This is a MUST after seeing all the Chihuly sculptures. 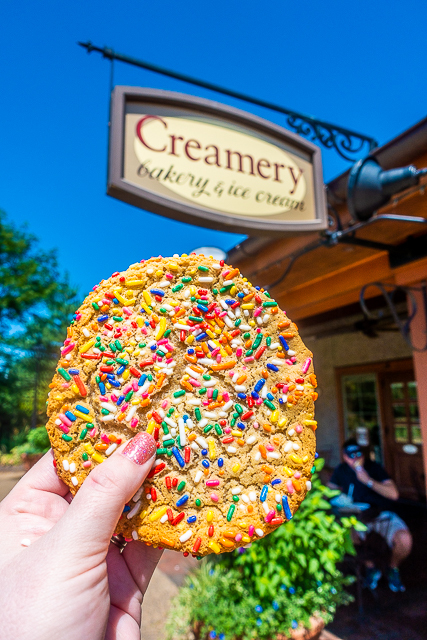 Of course we couldn't pass up the sprinkle sugar cookie! 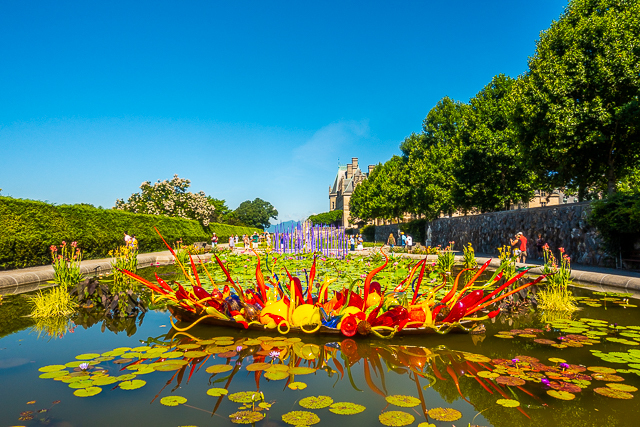 The Chihuly exhibit will run through October 7th at The Biltmore. The exhibit is included in your daytime ticket. 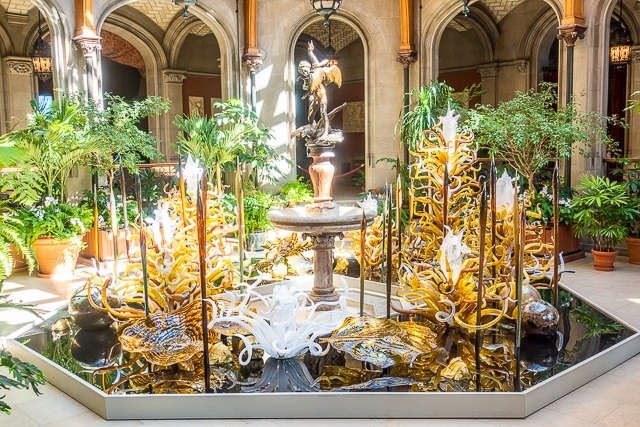 There is a Chihuly Nights at the Biltmore exhibit as well. 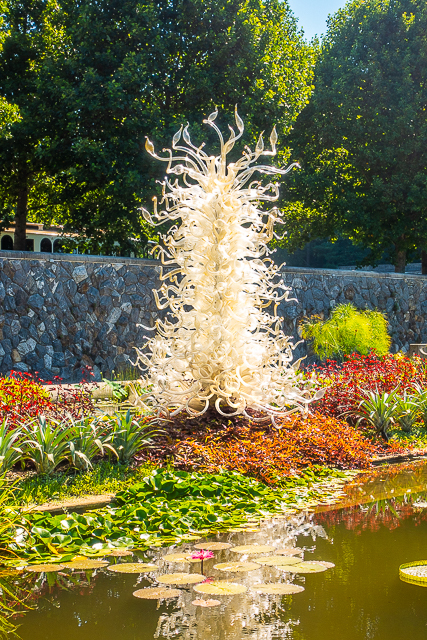 You can see all the glass sculptures light up at night in the gardens. 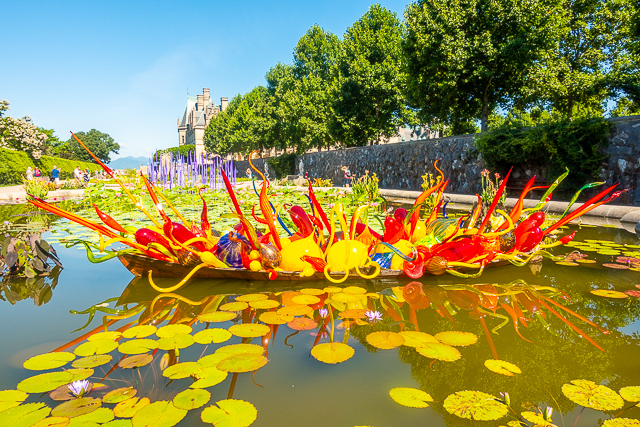 The Chihuly Nights at the Biltmore requires a separate ticket. If you have the change to go, I highly recommend it. If you can't make it, I hope you enjoyed the pictures today! So beautiful! Did they mention anything about how they transport the sculptures? Everything looks so fragile. I’d be a nervous wreck packing up the pieces! Glad y’all had a great time!! Ditto here. First thing I thought of, especially for the towers! I hope you got a chance to see the exhibit at night too. It’s stunning! 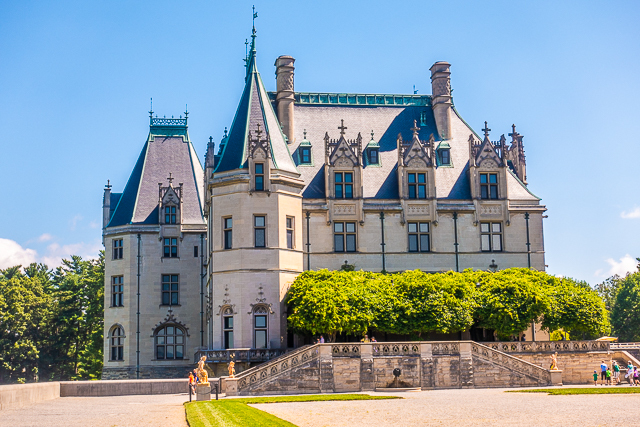 I saw both the Atlanta and Biltmore exhibits. I’d love to go to Seattle to see his studio. So beautiful!! 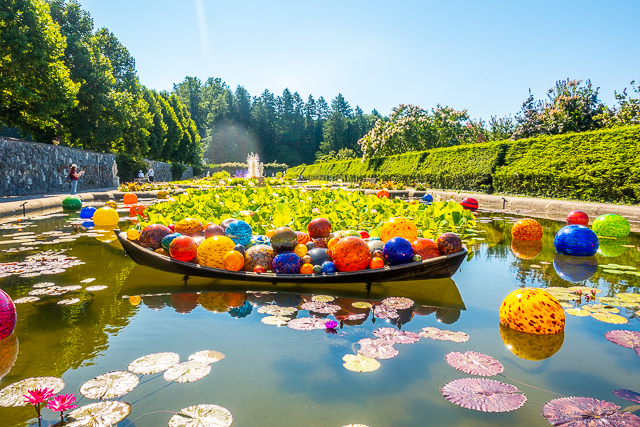 I love Chihuly's art! Was able to see the exhibit when it was in AZ. Looks like you had a great time...thanks for sharing! What beautiful work. He is extraordinary. You should consider a visit to Columbus, Ohio! 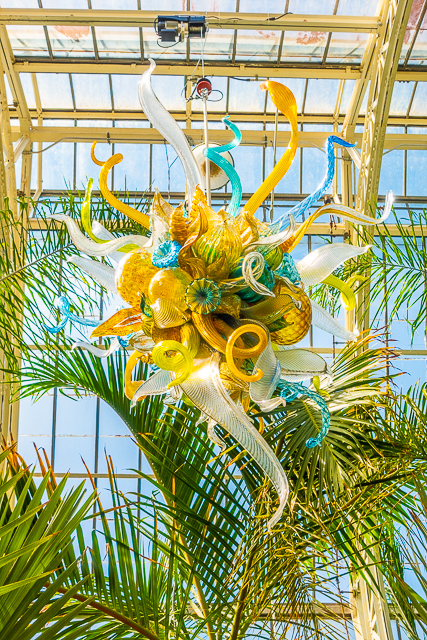 We have Chihuly on permanent display at our Franklin Park Conservatory, and a surprisingly good restaurant scene! Sounds like I need to plan a road trip!! Thanks for sharing! It's beautiful there. 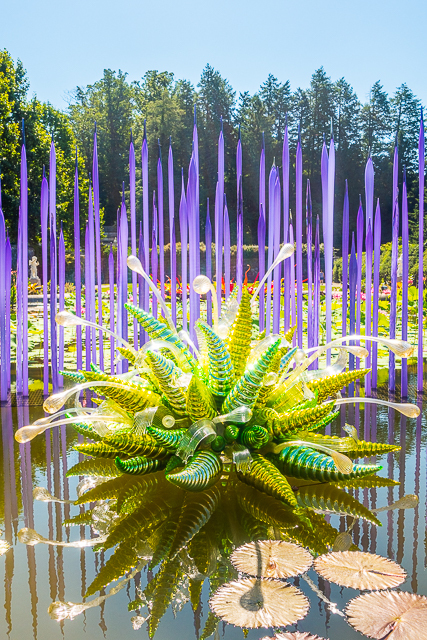 I went to the Seattle Chihuly museum under the Space Needle! It's a must see bucket list item! The Seattle museum is AMAZING!!! Definitely worth the trip to Seattle - I am dying to come back and go again.